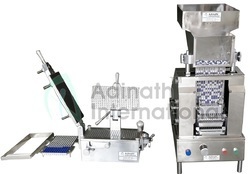 This is a most versatile Manual Capsule Filling Machines suitable for all classes of pharmaceutical manufactures providing Powder Filling Machines, Capsule Filling Machines etc. It combines GMP design and construction. The equipment is simple to operate with no variation and with negligible rejection. Successfully meeting the demands of customers as a manufacturer, supplier and exporter, we are engrossed in offering Manual Capsule Filling Machine. Engineered to precision, these machines are designed and developed by our team of engineers, which holds extensive knowledge of this domain. Apart from this, these machines are capable to fill powders, pellets in all sizes of hard gelatin capsules, owing to which demanded across the globe. Capsule Filling Machine is widely uses form of capsule filling. Machine is designed and manufactured with utmost care to handle all capsule sizes ranging from “00” to “5” and to give you trouble free services year after year. Machine is easy to operate, give production with minimum rejection and no weight variation. It is capable to fill powders, pellets in all sizes of hard gelatin capsules. Though all the operations are manual, the machine calls for precision machined components and assembled with highly skilled personnel. 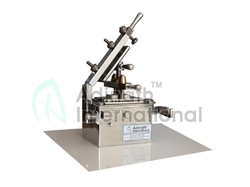 The Manual Capsule Filler is widely uses in Research Laboratories, Academic Institution, Herbal/Ayurvedic preparation and medium to small scale manufacturing industries. There is option of buying an Automatic Capsule Loading Machine to speeds up the production output with filling machine, as the maximum time taken by filling machine is for loading of capsules on the loading trays of the capsule filler. Net Weight: 40 kgs Approx. Gross Weight: 55 kgs Approx. Hand Capsule Filler is compact & versatile model for the filling of hard gelatin capsules. Manual Capsule Filling Machine is uses in pharmaceutical, cosmetic, food, veterinary, biotech & allied industry. We are having two model in this machine, first is GMP model which is completely made from Stainless Steel and other is Standard model which also made from stainless steel except machine base which is made from hard chrome plated materials. GMP model made for the customer in pharmaceutical industry and Standard model made for the customer from Food, Cosmetic, Chemical & other industries other than pharmaceutical. This 300 Holes Manual Capsule Filling Machine is widely uses in laboratories, R&D labs, Research organizations and small scale manufacturing facilities. Apart from 300 Holes Manual Capsule Filling Machine, we also offer 100 Holes Manual Capsule Filling Machine. 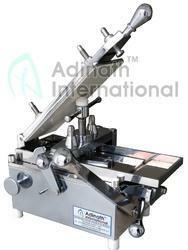 Manual Capsule Filling Machine is compact & versatile model for the filling of hard gelatin capsules. 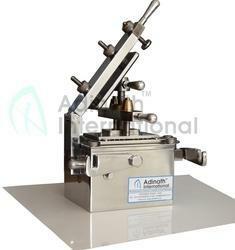 Manual Capsule Filling Machine is uses in pharmaceutical, cosmetic, food, veterinary, biotech & allied industry. We are having two model in this machine, first is GMP model which is completely made from Stainless Steel and other is Standard model which also made from stainless steel except machine base which is made from hard chrome plated materials. Table-Top Capsule Filling Machine is widely uses form of capsule filling. Machine is designed and manufactured with utmost care to handle all capsule sizes ranging from “00” to “5” and to give you trouble free services year after year. Machine is easy to operate, give production with minimum rejection and no weight variation. It is capable to fill powders, pellets in all sizes of hard gelatin capsules. Gross Weight: 55 kgs. Approx. Hard Gelatin Capsule Filler is compact & versatile model for the filling of hard gelatin capsules. Manual Capsule Filling Machine is uses in pharmaceutical, cosmetic, food, veterinary, biotech & allied industry. We are having two model in this machine, first is GMP model which is completely made from Stainless Steel and other is Standard model which also made from stainless steel except machine base which is made from hard chrome plated materials. Nutritional Capsule Filler is compact & versatile model for the filling of hard gelatin capsules. Manual Capsule Filling Machine is uses in pharmaceutical, cosmetic, food, veterinary, biotech & allied industry. We are having two model in this machine, first is GMP model which is completely made from Stainless Steel and other is Standard model which also made from stainless steel except machine base which is made from hard chrome plated materials. Dimension 375mm x 280mm x 400mm approx. Dimensions 375mm x 280mm x 400mm approx. Small Scale Capsule Filling Machine gives output of 25,000 to 30,000 capsules per hour and suitable for filling capsules of all sizes with powder, pellets & granules. It is comparable to the best because of its outstanding mechanical & functional features. This innovative design & precision manufacturing meets the requirements of cGMP. Machine is most ideal choice in Semi Automatic Capsule Filling Machine available in the market. High Speed Capsule Filling Machine that can fill powder/pellets into hard gelatin capsules. The machine work on temping principle. The powder is formed into a slug and is delivered to the body of the capsule. The machine is designed to give output of 70,000 capsules per hour with high filling accuracy and can fill capsule sizes 00, 0, 1, 2, 3, 4. The actual production depends on the quality of capsules, characteristics of filling powder/pellets and humidity condition. The machine is made as per GMP standards. All contact parts are made from Stainless Steel 316 and other non contact parts are made from Stainless Steel 304 material. The basic machine supplied to fill powder with one set of change parts as per users requirements. Pellets filling arrangement can supply as per customer’s specific requirements. Net Weight 1500 Kgs. Approx. Hand Held Capsule Filler gives output of 25,000 to 30,000 capsules per hour and suitable for filling capsules of all sizes with powder, pellets & granules. It is comparable to the best because of its outstanding mechanical & functional features. This innovative design & precision manufacturing meets the requirements of cGMP. Machine is most ideal choice in Semi Automatic Capsule Filling Machine available in the market. Manual Operation Capsule Filling Machine gives output of 25,000 to 30,000 capsules per hour and suitable for filling capsules of all sizes with powder, pellets & granules. It is comparable to the best because of its outstanding mechanical & functional features. This innovative design & precision manufacturing meets the requirements of cGMP. Machine is most ideal choice in Semi Automatic Capsule Filling Machine available in the market. Net Weight 20 kgs. approx. Bench Top Capsule Filling System gives output of 25,000 to 30,000 capsules per hour and suitable for filling capsules of all sizes with powder, pellets & granules. It is comparable to the best because of its outstanding mechanical & functional features. This innovative design & precision manufacturing meets the requirements of cGMP. Machine is most ideal choice in Semi Automatic Capsule Filling Machine available in the market. R&D Capsule Filler gives output of 25,000 to 30,000 capsules per hour and suitable for filling capsules of all sizes with powder, pellets & granules. It is comparable to the best because of its outstanding mechanical & functional features. This innovative design & precision manufacturing meets the requirements of cGMP. Machine is most ideal choice in Semi Automatic Capsule Filling Machine available in the market. We are among the pioneers in the industry for manufacturing and exporting Manual Capsule Filling Machine. The offered machine is regarded by our customers for its high tensile strength and speed. It is used for filing capsules and ensures the maintenance of hygienic parameters. This machine is latest in terms of design, easy to maintain and non-corrosive as well. Bench Top Capsule Filling Machine is compact & versatile model for the filling of hard gelatin capsules. 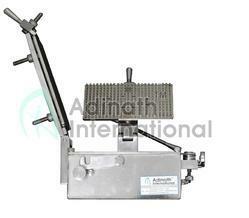 Manual Capsule Filling Machine is uses in pharmaceutical, cosmetic, food, veterinary, biotech & allied industry. We are having two model in this machine, first is GMP model which is completely made from Stainless Steel and other is Standard model which also made from stainless steel except machine base which is made from hard chrome plated materials. We manufacture, supply and export best quality GMP Manual Capsule Filling Machine due our vast experience and in-depth knowledge of this domain. Available with us at industry leading prices, these machines are easy to operate and require minimum maintenance. In addition to this, these machines are known for their optimum performance and energy efficient design. Laboratory Capsule Filling Machine gives output of 25,000 to 30,000 capsules per hour and suitable for filling capsules of all sizes with powder, pellets & granules. It is comparable to the best because of its outstanding mechanical & functional features. This innovative design & precision manufacturing meets the requirements of cGMP. Machine is most ideal choice in Semi Automatic Capsule Filling Machine available in the market. The Automatic Capsule Loader is sturdy, compact in design and simple in operation. Capsule Loader is suitable to fill loading tray of manual capsule filling machine automatically. Machine is preferred choice of medium & small scale pharmaceutical units for producing capsule products. It gives higher production at lower cost and better standards of accuracy. Loader automatically loads empty capsule in the loading plate for manually operated capsule filling machine, hence it take normally 5 minutes to load empty capsule in 300 holes loading plate manually, this machine cuts down that time to only 30 second. 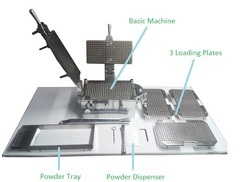 With the help of one Capsule Loader you can fill loading plates of 2-3 capsule filling machines. Thus increase the production on one hand and reduce the number of operator & equipment coast on other hand. Note: Electrical characteristics can be adjusted as per customer’s domestic power requirements. Due to our rich experience and vast knowledge of this domain, we have been able to offer premium quality 300 Holes Capsule Filler to our prestigious customers. These fillers are used in various pharmaceutical industries for capsule filling applications. In a zest to attain optimum customer satisfaction, our team of logistics professionals assures timely delivery of these capsule fillers at the customer's end. Size 410mm (l) x 450 mm (W) x 500 mm (H) approx. Dimension 410mm (l) x 450 mm (W) x 500 mm (H) approx. Product DescriptionManual machine is unique type capsule filling machine suitable for filling wide range of capsules. It has established values in the R & D segment of pharmaceutical industry. In Pharmaceutical Companies device is uses for smaller batches, trial runs and as a standby operations. The equipment is simple to operate, and gives negligible rejections,with no weight variations. Option of complete SS 304 and complete SS 316 contructions models. The SS - Stainless Steel Model is fabricated completely from Stainless Steel 304 quality and non-contact parts are made out of non corrosive metal duly hard chrome plated. 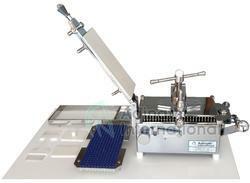 We are also having 100 Holes Capsule Filling Machine apart from 300 Holes Hand Operated Capsule Filling Machine.